Posted on 25/07/2013 by U.N. The least thing one would expect more than 2000 miles west of the rustbelt and just 50 miles out of Hollywood is a fully integrated steel mill. But it was there, built in 1942 by Henry J. Kaiser on a former hog farm and ,mostly ,dismantled in the late 1980ies. In the early 1940ies Kaiser Industries were in search for a steel plate supply for their nearby Richmond shipyards where more than 700 vessels, mostly “Liberty Ships” were built during WWII. In 1942 ground was broken in Fontana and by 1943 a coking plant, one blast furnace (“Big Bess”) with a capacity of 1200 tons/d and an open hearth shop were under fire. A 148″ plate mill was added in 1943 and the 86″ hot strip mill started in 1950. 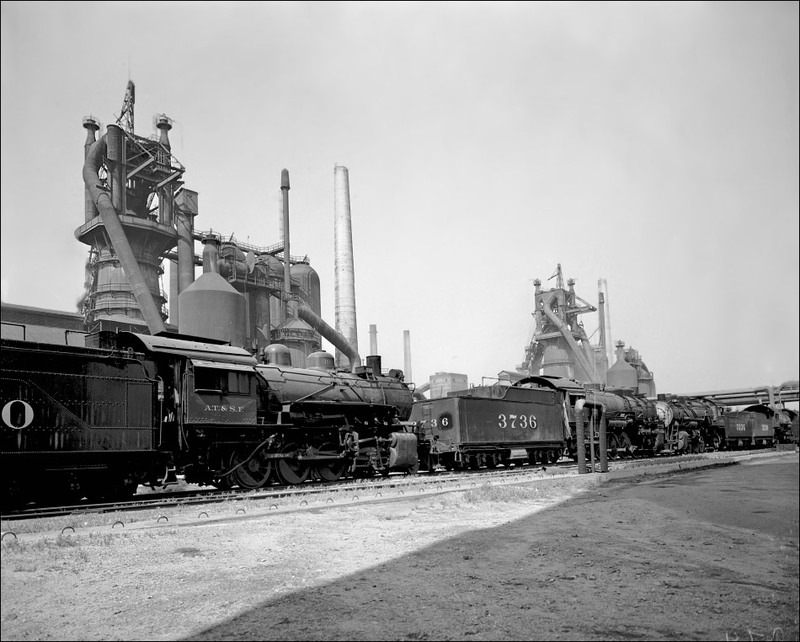 In it’s heyday the mill ran four blast furnaces(hearth diameter 8,7 -8,9 meter) and installed the second BOF steel making shop in the U.S. as early as 1955. In the 1960ies the location 50 miles away from the coast (imposed by the U.S. Army) at the so called “Inland Empire” became an increasing problem with all raw materials having to be hauled in by rail. In a last attempt to make the plant competitive a new BOF shop and a continuous caster were built in 1978 to be closed down for good already in October 1983. Kaiser Steel filed bancruptcy and the plate and hot strip rolling mills were taken over by California Steel Industries in 1984, supplied with slabs from overseas. The plate mill was sold to the Oregon Steel Company in 1989 and abandoned in 1994.The 86″ hot strip mill is still active. The remaining iron and steel making facilities were occasionally used by nearby Hollywood studios as a film set (Terminator2) and later dismantled. The BOF shop was bought by the Capital Iron & Steel Co and shipped to China in 1993. The ground is now overbuild by a car race track. This entry was posted in Historical, Works and tagged Blast Furnace, California Steel Industries, Fontana, Kaiser Steel, Steel Mill, USA by U.N.. Bookmark the permalink. bizzare! Do you have some bigger resolution of the second image?